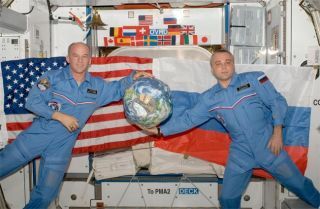 NASA astronaut Jeffrey Williams (left), and Russian cosmonaut Maxim Suraev hold a globe with the Expedition 22 logo while floating in the Harmony node of the International Space Station Dec. 13, 2009. After a few quiet weeks in space, the two-man skeleton crewis about to get some company in the form of three new crewmates due to dock atthe International Space Station today. NASA astronaut Timothy(T.J.) Creamer, Russian cosmonaut Oleg Kotov, and Japanese astronaut SoichiNoguchi launched Sunday aboard the Russian Soyuz TMA-17 spacecraft from Kazakhstan.They are set to catch up with the space laboratory at 5:58 p.m. EDT (2258 GMT). After docking, the spaceflyers will check the seal betweenthe two spacecraft to make sure there are no leaks, in preparation for openingthe hatches at 7:29 p.m. EST (0029 GMT Wednesday). The three new arrivals will join current station commander JeffWilliams, a NASA astronaut, and flight engineer Maxim Suraev, a Russiancosmonaut. The two have been taking care of the space station alone for threeweeks after three spaceflyers departed Nov. 30. "We're looking forward to their arrival in two shortdays," Williams radioed down to Mission Control after watching a video ofthe TMA-17 launch. Kotov and Noguchi, veteran spaceflyers, have visited theorbital outpost before, though it was smaller in both physical size and crewcomplement in the past. "The last time I visited, there were only two peopleonboard," Noguchi said in a preflight interview. "I'm looking forwardto that new way of living in space." Noguchi traveled to the station on 2005's STS-114 flight ofthe space shuttle Discovery. At that point, the space station lacked a numberof the large rooms it now has, including the Japanese Kibo module and theEuropean Columbus laboratory. Creamer, Kotov and Noguchi are slated to stay onboard the spacestation until May 2010. During their tenure they will see the arrival oftwo visiting space shuttle flights as well as numerous Soyuz dockings andunmanned cargo ship deliveries. The three newcomers will serve as Expedition 22 flightengineers. Then, in March 2010, Kotov is scheduled to relieve Williams ascommander and begin the station's Expedition 23 mission. In January, Kotov is set to participate in a spacewalk, orEVA (extravehicular activity) with Suraev. The two will work to integrate thenew Russian Poiskmodule, which arrived at the station in November. "Just after arriving to the station we will have toperform the EVA," Kotov said. "I'm really looking forward [tothat]."